It’s odd being on the flip side of a literal holiday celebrating something you are mourning the loss of. It was strange to wake up with that feeling in the pit of my stomach, when I realized others were running into their dad’s room with presents and maybe heading to church where they’d make him a cute craft. As a consolation, I tell Audrey that some people have dads that are alive, but they’re not good dads, but she had a great dad. Poor, poor consolation really. 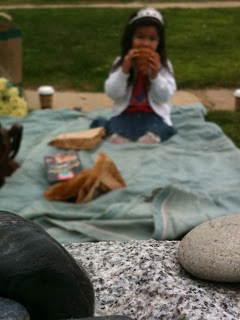 We skip church, pick up croissants, hot chocolate for Audrey, a latte for me, cookies you liked, and white roses chosen by her- and head for a picnic at the cemetery. When she first started coming with me, I brought her hot chocolate to make it more “fun.” Now it’s become a tradition- and even in late June- this was her request. It is fitting, I think to myself- something so bizarre- hot chocolate in June. Gone at 33. I’ve been so busy with my endeavor to secure a house for us, unlike last year- I’ve barely had time to prepare this year. It just came. I felt it more a couple of weeks ago when I got that punch in the stomach when Audrey had made the preschool “Father’s Day” craft for her grandpa. That was fine to give her something to do at that time, but I feel strongly that it’s not “Grandpa Day,” but “Father’s Day,” and she has/had one awesome father. So I prefer to remember him and honor him in whatever way we can this day. She wore her Korean soccer shirt you got her. 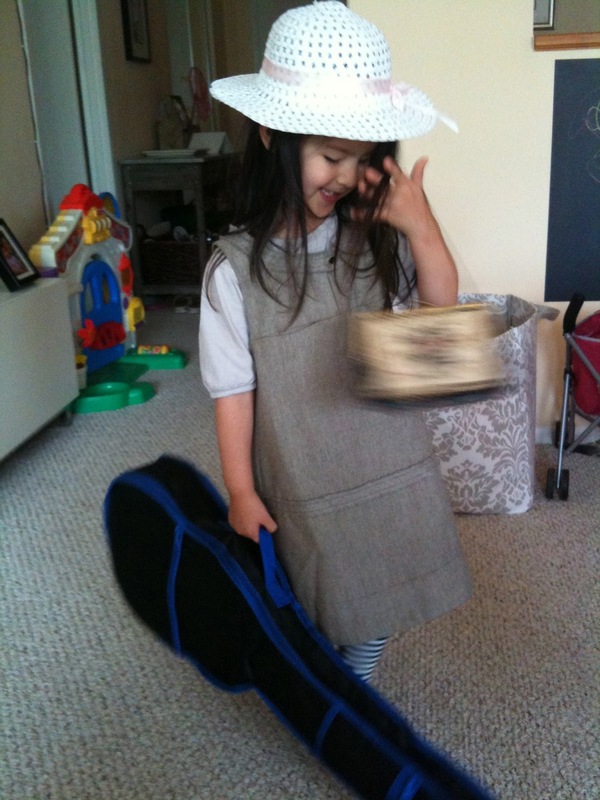 It is probably the last year it’ll fit her. She wore it last Father’s day as well- her first time at the cemetery. I always give her a choice if she wants to do things or not, and she readily agreed to wearing the T-shirt because it was from you- I know this because she usually makes quite a fuss about wearing pink and dressing “fancy.” Actually, she did add a crown to her ensemble in the end. This year was very different than last year, despite the similar feeling of dread. Only a few people emailed me or texted me to say that they were thinking of us. I am now an old pro about driving to the cemetery so I didn’t have the same anxiety I did last year when it was my first time going alone. I also didn’t burst into tears the second we got there. I laid out a blanket. Picked up the old flowers from last month and threw them in the nearby garbage bin. I unpacked our croissants and we enjoyed them along with a favorite cookie of yours. I sang a worship song you liked, and shared a few memories of you. I told Audrey how we were kind of up on a hill like in the Sound of Music- a real hit around our house right now- and we sang together, “The hills are alive…with the sound of music…” It was… strange. Audrey laid out each of the white roses like a small fence with the buds pointing forwards in front of your stone. It looked beautiful. Then, before we left, we said it together, “Happy Father’s Day appa.” Then- for the first time today- I cried. Then quickly dried my tears on the way back to the car, and we got in, chewing cinnamon gum- her current favorite- for the drive home. When we walked back into our apartment building, a few teenage girls were seeing off another couple in an SUV outside, “Happy Father’s Day!” one of them yelled. “That father’s alive…” Audrey said in her regular volume voice as we all got in the elevator together. At home we watched a few videos you took of her so we could hear your voice, again at her request…”He called me Audrey!” she said. The rest of the afternoon we played, danced (I really need to close my curtains) painted, and watched some Hans Christian Anderson fairy tales. Then we went out to eat with my dad at a Korean bbq place. I figured we might’ve gone there if you were here, and wanted to eat one of your favorite foods. Audrey loved the galbi. Everything I ordered was good. I missed having you beside me to do the ordering though, and I still find it so hard to enjoy a meal you would’ve loved while knowing you’re not getting to eat it. The whole thing is still so absurd to me; sometimes I think that’s the only reason I appear/feel stronger- because I am just getting used to the role, not that I really get this at all. The void- your absence- is gaping. I can never fill it. It pains me to think of all she’s missing out on here without you- when she’s scared of the giant inflatable slides at a child’s birthday, I’m imagining how you would’ve gone up with her and you both would’ve come down smiling. When she picks up her ukulele and it’s painfully out of tune, all I can really do is smile but I know you would’ve gone over to tune it right away for her. I think of that moment on Father’s day- your last, when she was literally jumping up and down in the living room and i told you how “she’s never like this…she’s so happy you’re here.” And I watch videos you took, all with your voice…and see her smile in certain way in them, that I realize, I will never see again. I think I also felt a strange peace though, knowing that you’d be so proud and in awe of Audrey. What better gift can I present you with than the little girl you never knew- and the little girl she is becoming. Like the way she says “Awight?” all the time now so seriously when she’s trying to tell me something. “You’re the princess in the pink dress, awight mommy?” Or the way when even I try to say I did something wrong or someone else did, she’ll think for a second and then say, “It’s nobody’s fault.” Or the way if I tell her I really like her dress, she’ll add, “We both look pretty…” Or how sensitive she is- how she started to cry so much last night while watching Toy Story with another little boy at their house when Woody’s arm got ripped off. How afterwards she told me, “I know they’re toys, but they’re alive, and I just can’t stop thinking about it.” Or how when she asked me once what police do and I got to the concept of jail which I very briefly explained, she said, “Let’s not say that word ever again. It’s a sad word.” Or how she asked me this morning on the car ride home “What does government do?” and after I tried my best to explain and added that she could be a president or governor, she answered, “Nah, I’m going to be a cowgirl when I grow up.” How she says to me out of nowhere another day while I’m driving, “I know it’s hard for you sometimes mommy,” or how she decided one day that she had to dress up exactly like Maria Von Trapp when she first was on her way to the Von Trapp house carrying her guitar, and she did. Or how when she can’t do something right away, she works and works at it until she can…like skipping- the awkward thrust of her legs forward as she calls out, “I’m doing it!” and I laugh quietly, but she keeps trying until finally- yes, she looks like she’s actually skipping! Oh you would love to see her skip Dan. All that, and so much more, is what I offer you this year. Oh, I love that little girl. Yes…so much more is what you have to offer to Dan this year. Watching you raise Audrey is absolutely amazing and I love learning from you. I thought of you, Dan and Audrey so much yesterday. Love you lots, Julia! Stopped by here yesterday just to see if you'd written yet. Thank you for this memoir of a day, and not just any day. A hard day, a day for love, a bittersweet day of darkness and light. You and Audrey are both amazing.